During the week of his 95th birthday in 2013, Graham delivered his final message via more than 480 television stations across the U.S. and Canada. More than 26,000 churches participated in this My Hope project, making it the Billy Graham Evangelistic Association’s largest evangelistic outreach ever in North America. Several years later, Graham’s “new direction” led him to the Florida Bible Institute (now Trinity College of Florida), and later, Wheaton College in suburban Chicago, where he met fellow student Ruth McCue Bell, the daughter of medical missionaries in China. The couple graduated and married in the summer of 1943. Mr. and Mrs. Graham and their five children made their home in the mountains of North Carolina. They were married for 64 years before Ruth’s death in 2007. After two years of traveling as a speaker for the Youth for Christ organization, Billy Graham held his first official evangelistic Crusade in 1947; but it was his 1949 Los Angeles Crusade that captured the nation’s attention. Originally scheduled to run for three weeks, the “tent meetings” were extended for a total of eight weeks as hundreds of thousands of men, women and children gathered to hear Graham’s messages. The Billy Graham Evangelistic Association is a nonprofit organization that directs a range of domestic and international ministries, including: Franklin Graham Festivals, Will Graham Celebrations, The Billy Graham Library, The Billy Graham Training Center at The Cove, SearchforJesus.net, the Billy Graham Rapid Response Team of crisis-trained chaplains, My Hope with Billy Graham TV ministry and others. 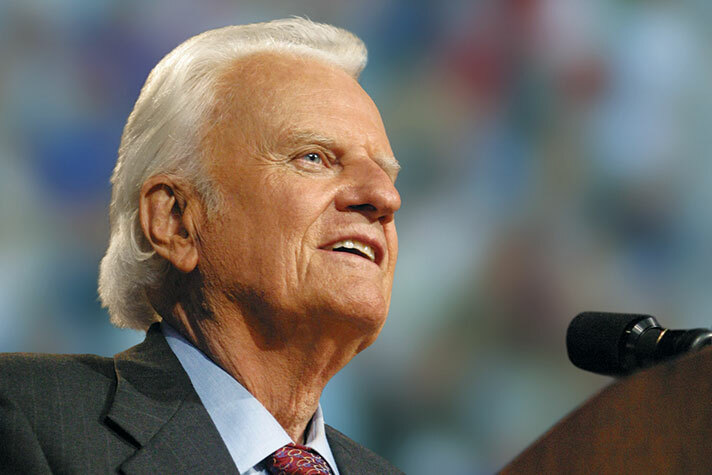 Founded in 1950 by Billy Graham, the organization has been led by Franklin Graham since 2000. The ministry employs some 500 people worldwide and is headquartered in Charlotte, North Carolina, with additional offices in Australia, Canada, Germany and Great Britain.